Skates are the curious bottom-dwelling cousins of rays and sharks. They have a diamond shape that yields two lovely and edible wings. With a texture similar to scallops, skate wings are delicate and sweet. They provide a healthy, lean and exotic alternative to more traditional finfish and shellfish. Previously anonymous, skate wings have risen to a new popular status in the United States as culinary prowess has uncovered their succulent secrets and created many savory recipes. 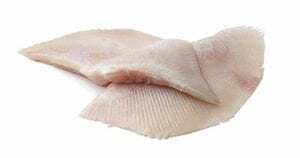 The meat of a skate wing is beautifully striated, resembling a delicate fan that can be used to create a aesthetically pleasing dish to add to your menu. Each wing yields two fillets, one from the upper side and the other from the lower. A classic recipe involves serving skate wings fried with white wine and browned butter. Baking, poaching or sautéing are all delicious options. They must also be cooked gently, as their fine muscle structure makes them breakable when flipping or moving and they will become rubbery if overcooked. Your chef may serve the finished fillets atop fingerling potatoes or fresh vegetables and top with capers for an artistic touch that your diners will love. The skate fishery is complex, as there are multitudes of unique skate species that are spread out over different habitats. This makes population assessments difficult at times and some skate species have been overfished and are now protected. The industry has made positive advancements towards a well-managed system as we learn more about skate biology and characteristics. Pucci Foods guarantees that all of our seafood will always be of the highest quality. We are pleased to be a premier distributor for bay area businesses and families. Trust us to bring you and your customers fresh seafood from fisheries that work to protect the natural resources of our oceans. Order your wholesale skate wings from Pucci Foods by filling out the form on this page and a member of our team will be touch soon.